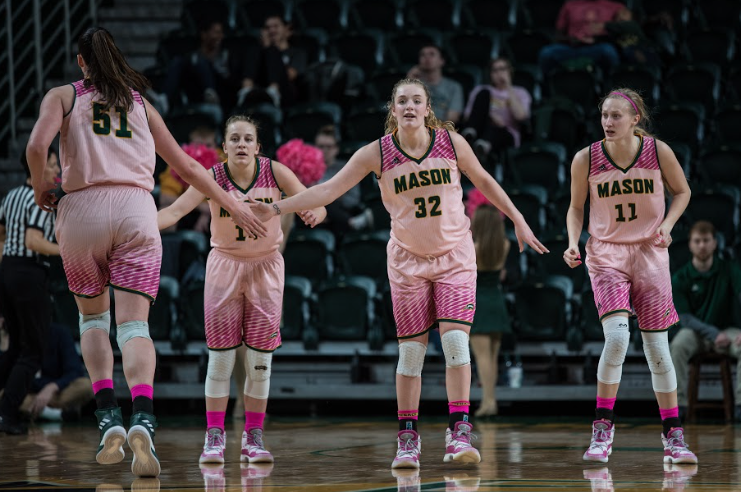 The Mason Women’s Basketball Team’s record-breaking run has come to an end in the second round of the WNIT, with a close loss to the Virginia Tech Hokies. 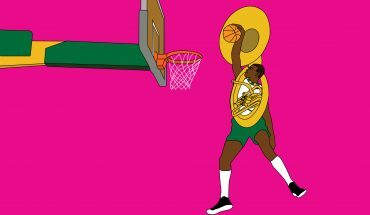 But in a historic season, there was more to the success than just the records. The Patriots began the season playing against No. 24/23 Michigan in the first round of the Preseason Women’s National Invitation Tournament (WNIT). This was only the program’s third appearance in the Preseason WNIT, and their first since 2001. Although the Patriots lost 75-61, only nine more losses would follow. The loss to Michigan was followed by a six-game win streak — just the second time this has happened in the last 24 years. However, the best was yet to come. Mason’s record was 11-3 by the start of conference play on Dec. 31, and the team had racked up their most non-conference wins in 30 years. Just two games later another record was set, as their 13-3 start was the Patriots’ best in the Division I era. The team’s hard work would continue to pay off throughout conference play. On Feb. 15, the Patriots beat VCU 65-42 and clinched their first 20-win season in 17 years. They finished 22-8 a few games later, breaking the program record for most wins in a season. The team finished 11-5 in the A-10, tying their record for most conference wins. 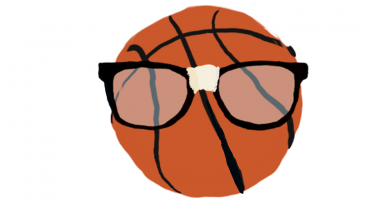 They were seeded fourth in the A-10 Women’s Basketball Tournament and had their best finish since they joined the conference, and highest since 2003-2004 while still in the Colonial Athletic Association. Postseason play did not end for the team after losing to George Washington in the second round of the A-10 Women’s Basketball Tournament. It was announced Monday, March 12 that the Patriots would be playing in their third postseason game in program history, and their first in 14 years. The Patriots won their first postseason game in program history, 82-75, against Stephen F. Austin State University later that week. This win was their 24th of the season — something that will set a program standard for coming seasons. Less than 48 hours after that historic win, the Patriots fell 78-69 to Virginia Tech in Blacksburg. The team was led by graduate transfer Butler, senior Tayler Dodson, and freshman Nicole Cardaño-Hillary, whose individual accomplishments helped lead the team success this season. Butler in a single season rose to 15th on Mason’s all-time rebounding list, and also breaking the NCAA record for most rebounds in a season. With her 33 double-doubles, Butler tied both the NCAA record for most double-doubles in a season and most consecutive double-doubles in a season. She also broke Mason’s single-season scoring record to become the Atlantic 10 Player of the Year. 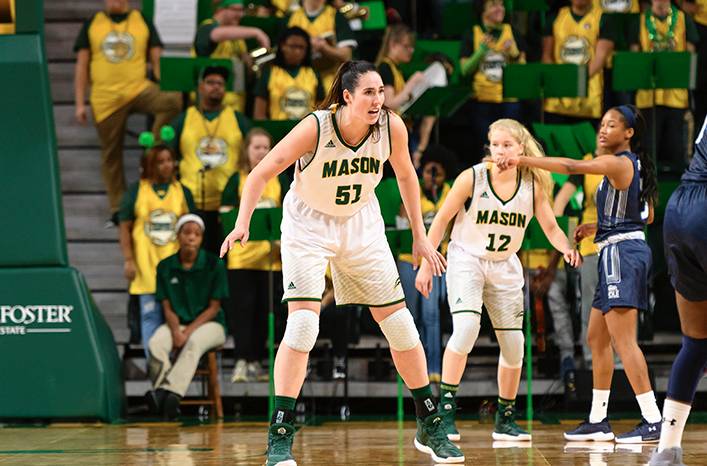 Dodson, who has been a consistent starter since coming to Mason four years ago, has played in a school record 124 games and started in 112 of them. Over her four years at Mason, she climbed to 22nd all-time in rebounds, and twelfth all-time in assists. Dodson’s first season the team finished 13-17, and third to last in the conference. She has witnessed the team grow throughout her time at Mason. Although still a freshman, Cardaño-Hillary was second on the team in scoring. She was named Atlantic 10 Rookie of the Year after also being named Rookie of the Week five times. This was the first time since 1997 that the A-10 Rookie of the Year and Player of the Year were named to the same team. Her contributions to the team were critical this season, as she scored more than 20 points eleven times, including 28 points against Stephen F. Austin. For full interviews with Mason’s coaches and players, click here.